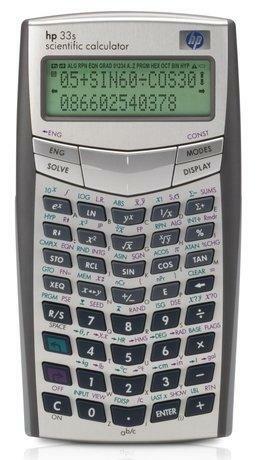 The HP 33s 2-line display scientific calculator is the long awaited replacement for the HP 32sII RPN Scientific Calculator. the 33s will have 32k user memory vs. 384 bytes in the HP 32sII, letter+4 program line labels (A0001 vs. A01), and cursor keys to navigate menus. It works in both RPN and algebraic modes. Features: keystroke programming, solve function, stats one and two variable, base-n function, 27 independent memories, trig, polar- rectangular, fractions, physical constants, unit conversions. Approved for use in NCEES Exam. LCD: 14 dot matrix (5 x 7 dots) x 2 lines. Power Supply: 2 x CR-2032 (same battery used in most PC motherboards). Battery life expectancy: 0.73 year @ 1 hr/day (approximately 9 months). Auto-power OFF: approximately 10 minutes. Material Specification: Plastic/rubber (with upper nameplate). Material of key top: Plastic. Dimensions: 158.0 x 83.0 x 16.1 mm (6.2 x 3.2 x .06 in). Weight: 119 g (4.2 oz). HP 33S Part Number: F2216A.